3/ FDI versus growing our own – firms cluster because co-location makes sense: they can tap into new ideas and pools of skilled workers and can share useful inputs (like fast broadband or VC investors). On the other hand, as Henry Overman and I have argued, clusters have tensions built in. As more firms enter, pressures on space build up, so rents rise. And competition rises, for staff and for market share. Given all this, it’s risky to base cluster development policies on foreign investment. If FDI simply brings in big multinationals, these might displace smaller, younger UK businesses. Even if this raises aggregate productivity, I doubt it's what Government or cities want in this case. Agencies like UKTI typically try and maximise the count and size of foreign investments. A different approach is needed here, which is to focus on the type of foreign inputs. 4/ Infrastructures – specifically FDI programmes should try and enrich the rest of the ecosystem, especially specialist services tech firms need: finance, lawyers, accountants and workspaces. This stuff is only just starting to appear in London at scale, and is likely to be a priority for other UK cities. Certainly, the UK’s VC scene has been pretty weak outside the capital. First, Tech North has little cash on the table: strikingly, its five-city budget is about the same as the original budget for East London. Second, a lot of the relevant policy levers are held at national level: tax breaks for investors, crowdfunding regulation, immigration and skills. That still leaves some local levers: branding, networking, planning and any local investment pots. But it’s limited stuff. Arguably some of these national levers should be devolved: that’s started to happen through City Deals and Local Growth Deals. But we’re at the very start of this process, and though the post-Scotland moment may yet shake things up further, what Ministers are handing over in powers they’re largely taking away in cuts. Originally posted on the squareglasses blog. I've been reading some of the recent material from the Foresight project on cities. In particular, I've been looking at the interesting piece by Ron Martin, Ben Gardiner and Peter Tyler on the long run economic growth performance of UK cities. While there's much of interest in this paper, there are also a few things that puzzle me - and this blog is about one of them. Specifically, I'm puzzled by the suggestion that ("the New Neoclassical") Urban Economics predicts a positive link between size and economic growth. Or, as the paper puts it: "It is often argued that larger cities confer greater economies of agglomeration and increasing returns effects, and that, holding other things constant, these effects make for faster growth: in other words, that city size, agglomeration and growth form a process of circular and cumulative causation." To my mind, this 'prediction' is muddling growth and levels. There is a large body of theoretical and empirical literature that suggests that, everything else equal, productivity will be higher in larger cities. It's also true that this literature supports the idea that initial shocks might be magnified by cumulative causation as the urban system adjusts to the shock. So, for example, a city experiencing a positive productivity shock might see a long run effect that is larger than the initial shock (as it attracts more workers and firms). This cumulative causation would, however, run its course once the city had adjusted. In the real world, this could show up as faster 'growth' over a number of years for a city experiencing a positive (productivity) shock. However, when we switch to long run growth - i.e. to truly dynamic processes that may take place over decades - the link to size is much weaker both theoretically and empirically. Indeed, while some theoretical papers suggest a positive link, there's a growing empirical literature that suggests there may be no relationship. In particular, starting with a paper by Xavier Gabaix in the Quarterly Journal of Economics there's been considerable interest in whether Gibrat's law - which says that there is no link between city size and growth - explains the tendency of city systems to follow Zipf's law (a power law that links the relative size of cities). In an early empirical contribution to this literature, myself and Yannis Ioannides provided evidence to suggest that cities in the US system do indeed follow Gibrat's law. More recently, I've done work with Sabine D'Costa which suggests that for the UK there is very little evidence of any link from city size to wage growth (even thought there is a strong link for wage levels). In short, the idea that there is no link between city growth and city size is a fairly mainstream 'neoclassical' position - and one that would reflect my own reading of the empirical literature (and indeed some of my own empirical work). So it's surprising to see the lack of a link between size and long run growth presented as somehow presenting a challenge to urban economists like myself. Part of the muddle here, I suspect, comes in the translation to policy discussions where there has been a tendency to conflate growth and levels effects. I've personally tried to avoid doing this in my policy orientated writings. For example, our work for the Manchester Independent Economic Review was concerned with the productivity advantage that Manchester had relative to the wider region - but this was a statement about levels not growth rates. But it's an easy slip to make when discussing complex issues but trying to use non-technical language. All of this also raises the much more important question of the implications for urban policy. At any point in time, the urban system is likely to have some large cities that are doing well and some that are doing badly (both in terms of growth and levels). The same is true for small and medium size cities. This reminds us that basing policy on size, per-se, isn't very sensible unless size correlates with some other important considerations - e.g. governance. This is why, for example, some of us pushed very hard to have the second round of English city deals focus on some of the smaller cities that were fast growing rather than just focusing on the (next ten) biggest cities. But neither does the lack of a link suggest that we should completely ignore the issue of size. If, for example, the government wants to have a northern city to act as a counterbalance to London then it may make sense to focus investment in a place (e.g. Manchester) that is relatively large and has relatively high productivity. The hope would then be that agglomeration economies might generate a cumulative causation process that helped further the positive impact of that investment. Whether this would happen in practice depends on the extent to which policy can generate productivity increases, whether congestion costs increase quickly or slowly, etc. If it was successful, the effects would show up as faster growth for Manchester in the short to medium run, but (as the data make clear) not necessarily in the long run. So the link between size, productivity and growth does matter for policy, even if - as seems likely - there is not a strong link between city size and long run growth. In May last year, I did some back of the envelope numbers on the role of foreign buyers in driving the London property market. On the basis of a very quick calculation I concluded that "domestic sources of demand (including from first time buyers) are much more important in understanding the overall London property market than a small number of rich foreigners." The rich countries are not about to be taken over by the poor countries, which would have to get much richer to do anything of the kind, and that will take many more decades. What then, is the source of this fear, this feeling of dispossession, which is partly irrational? Part of the reason is no doubt the universal tendency to look elsewhere for the source of domestic difficulties. For example, many people in France believe that rich foreign buyers are responsible for the skyrocketing price of Paris real state. When one looks closely at who is buying what type of apartment , however, one finds that the increase in the number of foreign (or foreign-resident) buyers can explain barely 3 percent of the price increase. In other words, 97 percent of today's very high real estate prices are due to the fact that there are enough French buyers residing in France who are prosperous enough to pay such large amounts for property. This is certainly in line with my priors but I'd love to see similar calculations for London. [The source for the precise 3% figure is a PhD thesis that proved to be beyond my (miserable) French - I'm not aware of anything similar for London]. Across the globe, governments are looking for ways to roll out reliable and fast internet access. Broadband is central to this ambition. For example, the European Commission’s ambition is that at least 50% of European households should have Internet connections above 100 Mbit/s by 2020. In the UK, the Coalition wants superfast broadband access for 95% of households by 2017, with a particular focus on cities. That’s drawn some flak from rural communities, many of whom exist on very slow connections. To an economist, such officially defined targets imply that governments see significant externalities from broadband provision, and that if left to markets, too many households would be left in the slow lane. However, putting a number on these spillover benefits is very hard. In turn, that leaves it unclear whether publicly subsidized improvements in broadband infrastructure really are socially desirable. I’ve just released this research, in which my co-authors Pantelis Koutroumpis and Tommaso Valletti and I try to quantify broadband’s benefits to households. We were particularly interested in the benefit users derive from internet usage above and beyond what they pay to their internet service provider (ISP). Measuring this ‘consumer surplus’, however, is difficult because we can’t directly observe what people would be willing to pay. To get around this, we argue that it is possible to indirectly infer the consumer surplus from property prices. In the UK every property is connected to one and only one internet delivery point - the local exchange (LE). Actual broadband speed critically depends on the distance of a property to its LE and the technology of the LE: fast connections need a property close to an LE, and for the LE to have fast hardware. All else equal, properties at such favourable locations will be more attractive and, as a result, will sell at higher prices. The value of a decent internet connection can therefore be inferred from a comparison of property prices across locations, controlling for other factors. Econometrically, there are two challenges with this approach. Firstly, there will always be some factors that shift property values and are unobservable in the data. Secondly, neighbourhood-level changes can lead ISPs to upgrade their LEs and at the same time cause house prices to increase. Our identification strategy addresses both concerns. Our most restrictive empirical models identify the broadband premium from changes in broadband speed and house prices over time and across LE boundaries. We compare properties that are located within a couple of hundred meters, but within different LE catchment areas – see figure. Within such a small range it is unlikely that distinct changes in speed that result from different upgrades in the two different LEs will be confounded with other changes in the neighbourhood. Using this strategy we identify the causal effect of broadband speed on property prices, from about 1m property transactions between 1995 and 2010, and three LE upgrade waves covering around 4000 exchanges. We find that property prices increase on average by about 3 per cent when internet speed doubles. Importantly, there are diminishing returns to speed. While the increase in value is even greater when starting from slow internet connections, an increase in nominal speed from 8 to 24 megabits per second raises the property value by no more than 1%. Another main finding is that the consumer surplus differs substantially across regions. It is highest in high income areas that are highly urbanized. As an example, the consumer surplus in London is almost twice as high as in any other of the English regions, reflecting very high usage in the capital city for both work and personal reasons. We use these estimates to compute the aggregate consumer surplus from taking all UK households on broadband to the 30 mbit/s target envisioned by the EC. Comparing the results to engineering cost estimates, we find that urban areas pass the cost benefit test by a large margin. The opposite is true for rural areas. This is partially because the benefits in these areas are lowest, and partially because the costs are highest. These results suggest that in rural areas it makes more sense for governments to adopt less expensive fixed and mobile technologies that deliver decent and reliable speed. 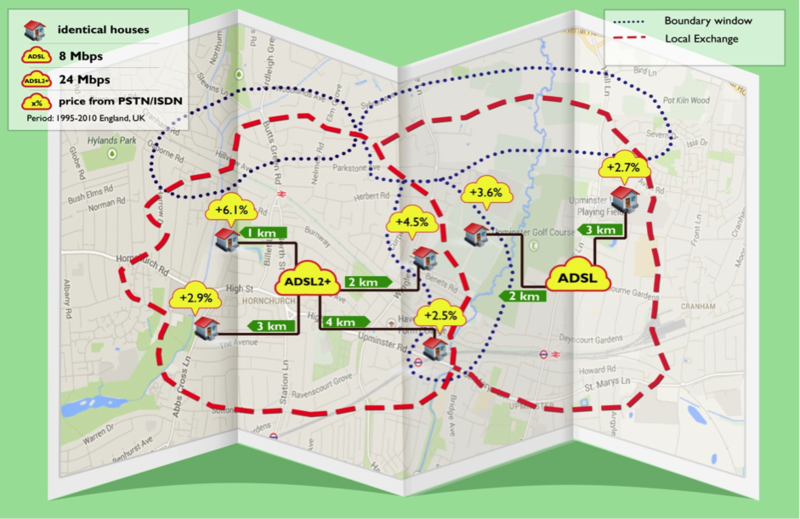 For urban areas, super-fast broadband is an economically viable technology. An equity issue arises, however, if all taxpayers pay for a subsidized rollout, but landlords in the targeted areas accumulate a large fraction of the benefits. A levy on landlords could help promoting the rollout of fibre while at the same time saving taxpayers’ money and reducing inequalities. One of the 'joys' of putting together a serious evidence based analysis of the effects of our planning system is to have planners turn round and dismiss the results because the analysis has not evaluated the benefits of planning. This is especially true since one of us was the first – and still one of the very few – to attempt rigorously to evaluate the net effects of restrictions on land supply; and found them to be substantial and negative in terms of their welfare effects. The issue is in reality that very powerful and dirigiste planning policies are introduced with no attempt to analyse the value of either the benefits they might generate or the costs they impose. Because it is absurd to try to claim that planning policies do not have any costs it is surely better to have a reasonable measure of what those costs are so when we evaluate benefits – whether identified quantitatively or qualitatively – we can set the benefits against their costs. Otherwise it is rather like the ‘ladies’ menu in a posh restaurant. Great claims may be made for the dishes but it is not possible to make an informed choice of what to eat unless you know that the foie gras costs £45 while the excellent artichokes are a snip for a fiver. Just such a policy is Town Centre First (TCF). The strict version was introduced almost on a whim in 1996 with the aim of concentrating new retail development on particular sites in central locations. One of the outcomes of this policy is highly visible: small local stores – such as Tesco Expresses or Sainsbury Locals – have mushroomed in locales that are deemed to be 'town centres' according to planners. At the same time, very few large scale supermarkets – built after 1996 – can be found out-of-town, where English households increasingly decide to live (ironically, in part this suburbanization is driven by planning restrictions in urban areas that make housing in those places increasingly unaffordable). This is because of the so called ‘sequential test’ that was designed to rule out all possible sites before allowing an out-of-town site even to be considered. The ultimate outcome of this has been that it became all but impossible to develop large format out-of-town stores in England after 1996. There are a number of obvious adverse consequences of forcing retailing into small and often awkward sites in ‘town centres’: these locations will be less convenient for suburban shoppers (an ever growing share of the population) and the smaller stores will, compared to large format out-of-town stores, be able to offer less variety, at higher prices. Another potential cost of TCF policy could be that it lowers efficiency by forcing stores onto more awkward and difficult to manage sites in intrinsically less productive locations. A major reason for their intrinsic lower productivity is likely to be the difficulty of supplying them efficiently. Supply depots remain located with respect to the motorway system and local planners and politicians (rather than retailers) choosing store sites in ‘town centres’ is not a recipe for efficiency. It is issues such as these that we explore in an article that is forthcoming in the Journal of Economic Geography. Using unique store-specific data from one of the four largest supermarket chains in the UK and exploiting useful variation in TCF policies between England and Scotland and Northern Ireland – where TCF policies were introduced later and much less rigorously, especially in Northern Ireland - we identify the loss of output imposed by the implementation of TCF policy in England. Also we have data on how planning restrictiveness has varied across English Local Authorities (LAs) since 1979. Our findings are staggering. The first is that the most restrictive LAs more or less plan supermarkets away from the communities they serve. A one standard deviation increase in the restrictiveness of a LA (which would move the LA from about average to be just in the top 15% in terms of restrictiveness) reduces the probability of their being a supermarket in it by 26%. Since more restrictive LAs also restrict the size of stores, the same increase in restrictiveness reduces the chain’s floor area in the more restrictive LA by 42%. The resulting scarcity of supermarket space does mean more sales per sq ft of floor area so the chains’ sales are reduced by ‘only’ 32% for a one SD increase in local planning restrictiveness. Turning to the direct impact of TCF policy, according to our most conservative estimate, the implementation of strict TCF policy in 1996, combined with the initial effect of tightening controls on out-of-town stores in 1988, caused a total loss of sales of some 32%. This is the total loss of output, all else controlled for, observed in an English store opened after 1996 compared to stores that opened up prior to 1988 (when retailers in England were still pretty free to choose optimal locations) - equivalent to more than a lost decade of growth in retail output. Our analysis suggests that the gross cost of constraining retail to sites and locations chosen by planners and local politicians rather than by retailers and shoppers, has a staggering price tag attached to it, up there with the £45 foie gras. Whether the price tag is too high depends of course on the benefits forcing retail to ‘town centres’ may deliver. The declared aim of TCF has been to make cities more ‘sustainable’ and retain access to shops for those without cars. To deliver any final verdict on TCF, these alleged benefits would also need to be rigorously quantified. As it is they are no more than claims because there is no evidence they exist. This is what we are trying to do in an ongoing project. Our still provisional findings do not suggest that TCF policies ‘deliver the goods’. What we find is that, since TCF was strictly imposed in England, adding new stores in a local shopping area reduces distances travelled for shopping in both England and Scotland, but it has done so much more in Scotland. This is not really surprising. Whereas in Scotland retailers built stores where households increasingly live and want to shop (in suburban and ‘out-of-town’ locations), in England planners and local politicians have deliberately made this much more difficult; new stores are disproportionately on sites that are less convenient for shoppers. To be sure; some shoppers will be better off. One of us does not have a car and lives near a ‘town centre’ high street. He appreciates the additional stores. However, not many households own no car and live near ‘town centres’. So, while TCF may be the equivalent of a nice meal for a few, for most of us it is probably an empty plate: or to mix our fables - emperor’s clothes. Either way it seems to have a very high price tag attached to it. Time for a more rational debate on 'mixing' in new developments? I may have made this point before, but I would love to see more sensible discussion of policy around mixed housing developments. I was reminded of this by the Guardian headline on Saturday about 'Poor doors' which highlighted the segregation that goes on in some of these developments. Personally, I find such stories unpleasant, but not at all surprising. If you share that sentiment surpress, for a moment, your outrage and ask yourself the following question - if the uncomfortable truth is that wealthy people don't want to mix with their poor neighbours (and can't be forced to do so) then what, exactly does this policy achieve? The first reason for encouraging such mixing draws on the literature about neighbourhood effects. The underlying theory is that this kind of mixing improves outcomes for poorer families. Unfortunately, the empirical evidence on this is surprisingly weak. There is evidence that families do better when they live in mixed neighbourhoods. But establishing that the causality runs from mixing to better outcomes (rather than the other way round) has proved difficult. The evidence that forcing mixing at such micro-scales (e.g. within the same blocks) improves outcomes is thin to non-existant. Perhaps not surprising when you start to think about the realities of mixing as highlighted by the Guardian article. The second reason for forcing mixed units is that it allows local authorities to extract 'development' rents from the private sector. In other words, by forcing them to provide some social housing in exchange for permission to develop you increase the supply of social housing. But mixing per se need play no part in this. Indeed, the irony is that you could increase the amount extracted from private sector developers if we didn't insist on social units being delivered in the very same development as the private sector units. This in turn would allow us to fund more social housing provision than we achieve with the current arrangements. In short, if forced mixing at the site level doesn't deliver clear benefits and reduces the 'tax' we can extract from developers - should we persist with it? A few decades ago, we were providing poor quality social housing on large estates, often in areas poorly served by public transport and far away from employment opportunities. We clearly do not want to see a return to that. But policy now seems to have swung to the opposite extreme where it insists on having a mix of social and private housing in every single new development. There is little strong evidence to support such a policy - which suggests that the optimal policy may lie somewhere between these two extremes. Perhaps it's time we had a sensible debate that tried to figure out where the appropriate balance might lie? I don't have a strong view on police and crime commissioners. But looking at a recent article on the West Midlands by election I was intrigued to notice that "the Home Office has chosen to spend an extra £1 million on a pilot programme sending publicity booklets to every household in the region in an attempt to drum up interest in one of the coalition’s flagship policing policies." "This trial will allow the Government to evaluate whether the delivery of election booklets to residential premises significantly raises voter awareness about the candidates standing in a PCC election." This sounds potentially interesting - after all we'd like to know whether providing information to households improves awareness, perhaps even increasing their chances of voting. In order to figure that out we'd need to provide information to some households and not others and follow up to see whether households that got information had better awareness, voted more, etc. A second best alternative might be to have some areas receive leaflets others not. We would, of course, need to randomise this because selecting specific households or areas might give some candidates an advantage over others. However, with a big enough election randomising the provision of information shouldn't favour one candidate over another, but should increase turnout in the group getting leaflets relative to those that don't (if providing information helps). Unfortunately, it appears that the 'pilot' in the West Midlands by-election won't allow us to do any of this because the leaflets are going to all residential addresses. Without a comparison group it will be impossible to figure out whether providing information has an effect on voter awareness or increases turnout. Even before and after comparisons for a sample of households won't tell us anything much given that coverage of the election should increase voter awareness over time. I have no idea whether the electoral commission would allow randomisation of election information (there's a case that they should). Either way, in the absence of a suitable comparison group, it's difficult to see how the £1m pilot in the West Midlands can tell us anything useful. It was excellent to see concern and rational debate about the English housing crisis and its causes getting coverage in the mainstream press over the weekend. There was an ‘exclusive’ in the Sunday Express on 6th July, linking concerns about housing supply and the shortage of land produced by two generations of ‘urban containment’ with the Deputy Governor of the Bank of England’s warning that the housing market now posed the greatest single threat to economic recovery. Much of the piece was based on a phone conversation I had with the Whitehall correspondent, Marco Giannangeli. No concerns about his representation of my basic message. But there were some issues with the details! Maybe it is the academic’s inner pedant; or the form of Chinese whispers which a phone conversation to a reporter, however skilled, who then writes his story which is then edited and subedited by people who have not heard the original conversation and finally cut to fit the space available given daily news pressures. Maybe the problem was that the season is not yet silly enough so there is still an awful lot of serious stuff happening in the world squeezing out other subjects. Whatever. Here is a blog to alert readers to the interest of the Sunday Express in SERC research and correct a few misrepresentations in the story as it appeared in the paper compared to the conversation with Marco! The first was a classic confusion. There are 1.6 million hectares of Greenbelt land in England, not 1.6 billion. I think that 1.6 billion hectares is a good bit bigger than the entire USA. The published piece had me condemning the Help to Buy scheme out of hand as just inflating house prices. I was a bit more nuanced about HTB but these got lost. There are 2 separate schemes or elements to HTB. The first is aimed only at those buying new build houses. This may slightly increase supply. So it will not only have the effect of increasing house prices. But there is another separate scheme supporting anyone buying any house costing less than £600 000. That will have the effect of mainly increasing house prices. Together they certainly have the effect of increasing house prices and it is possible – we do not yet know because we do not have the evidence - that the net effect will be to make housing yet less affordable (i.e. not help, but hinder, buying; that depends on whether overall the increase in house prices the two schemes generate outweighs the help to the particular people who take advantage of the schemes). I first blogged about HTB immediately after the 2013 Budget. The Sunday Express piece did correctly report me as saying that 20% of the GLA area is covered by Greenbelt designation. But the idea we could build 1.6 million houses on this area of Greenbelt within London is far too mechanical. The total area of Greenbelt within the GLA boundary is 32,500 has. Currently expected densities (which are too high) are 50 houses to the ha so if every single m2 of Greenbelt land within the GLA was built on that would add to about 1.6 million houses but it is not at all reasonable to think that every available ha could or should be built on . We do need green spaces! There was also a confusion between Greenbelt area within the GLA (32,500 ha) and London’s Greenbelt. This stretches out to Aylesbury and Southend and covers about 514,000 ha in total – i.e. most of the Home Counties. It is this much bigger area (514,000 ha) that contains nearly 20,000 of Greenbelt land within 800 metres of a station not built on and not in an Area of Outstanding Natural Beauty or covered by a Site of Special Scientific Interest protection or any other indication that it is land which is environmentally valuable or amenity rich. Thanks to Barney Stringer for this statistic. I have finally had a chance to take a look at George Osborne's 'Northern Powerhouse' speech in which he suggests that a better connected collection of northern cities could take on the world. It's an interesting (and not entirely new) proposition. But would it work? Could joining up northern cities replicate London's success? Crucial to answering this question is the role that scale and physical proximity play in driving London's success. The evidence suggests that these are pretty important - agglomeration economies arising from scale and proximity help explain London's success. Once we recognise this, it has fundamental implications for what a more balanced UK economy might need to look like. If creating similar opportunities to London requires similar scale and physical proximity, could we get anywhere near this by 'joining' up our Northern cities through greater infrastructure investment? I remain sceptical - not least because our work for the Northern Way estimating the impact of quite substantial reductions in travel times between Manchester and Leeds suggests only modest economic gains. In our work, we looked at the impact of a 20 minute reduction in travel time between Leeds and Manchester. We find that closer integration between Manchester and Leeds could be expected to have a positive effect on wages. Our largest estimate, for a 20 minute reduction in train journey times between Leeds and Manchester, has average wages increasing by between 1.06% and 2.7%. These numbers come with some important caveats (discussed in more depth here). First, they are certainly not additional for the UK as a whole because a lot of this effect would come from the fact that Manchester and Leeds will be attracting activity that would have gone elsewhere (and not necessarily to London). Second, and related, the effects for an individual worker, with given and unchanging characteristics (often called place-based effects), are smaller at somewhere between 0.20 and 0.50 of a percent. In short, joining up our Northern cities (particularly Manchester and Leeds) using HS3 would help, but it would be expensive and it's unlikely that it would be enough to provide an effective counterbalance to London. It is also important to note that a project like HS3 to link cities may not be as effective as other interventions. For example, in the detailed report for Northern Way (rather than the more widely quoted summary) we tried to use the same methodology to compare the effect of a 1% reduction in travel times within Manchester or Leeds to the effect of a 1% reduction between those two cities. In all cases, within city reductions in travel times lead to larger increases in 'economic mass' (sometimes two to three times larger). As it is these changes in economic mass that underpin any estimated productivity effects, this tells us that a 1% reduction of within city costs would have a larger effect than a 1% reduction of between city costs. Of course, that doesn't tell us whether we should prefer one over the other - that would depend on the relative costs of achieving these cost reductions (which we didn't look at). But it does serve to reinforce the point that it might be difficult to replicate London's advantages from scale and proximity simply by joining up different cities. It also highlights the crucial point that we need to consider the alternatives before rushing headlong for the HS3 solution. I'd argue that this was a mistake we made with HS2 - best not to repeat it. My bus journey in to work this morning took 90 minutes for 5 miles (due to arrangements for the Queen's Speech). Usually it takes around an hour on the bus. I can run it in 40 minutes and ride it in 25 (my preferred modes of transport). My reasons for mentioning this is that it got me thinking about my comments yesterday on transport spending across different areas. Towards the end of that piece I wrote as follows: "Why do we care about the balance of infrastructure expenditure per se? Surely we care about the provision of transport services, broadly defined. Is it fair to invest in areas with low congestion at the expense of investment in areas with high congestion just to ensure that expenditure is equal? Why should we invest equally in places with no or slow population growth at the expense of places that are seeing high and continued growth in population? Why do we need as much investment per head in towns with a population of 100,000 as we do in cities with populations of millions?" Inspired by my journey to work this morning, I went and took a look at the National Travel Survey to find out just how large is the variation in travel to work times by region. I've copied and pasted them below (where I've also added times for the average business trip). The variations across regions are pretty striking. The average Londoner spends around 41 minutes commuting compared to 23 minutes in the North East. Assuming 252 business days and 30 days annual leave that equates to a difference of 7992 hours (or 5.5 days) per year. These numbers aren't perfect (I'd like to see them income adjusted for example) but they point to huge variations in journey times. I am not in an way suggesting that these figures are 'unfair' but they paint a very different (and arguably more informative) picture than that coming from the figures on transport expenditure per capita. Lots of coverage for the Transport Committee's latest report on local transport expenditure. I've had a quick read through of the report. Some of it makes sense. For example: there's been lots of change in funding schemes so it would be a good idea of DfT makes sure this isn't delaying delivery or reducing accountability. They also make the point (which I have made before in the context of Heseltine) that: "It is questionable whether bidding for pots of central government money that will be allocated via rules set by central government amounts to genuine devolution." No arguments from me there. But the headlines all pick up on the recommendation that transport outside London should be funded better: "The under-funding of transport projects outside Greater London in recent years cannot be allowed to continue. Ministers must use the new funding arrangements, via the Local Growth Fund, to ensure that there is a fairer allocation of funding to transport projects beyond London, and not just in city regions, City Deal areas and current enterprise zones. No area across our nation should be second class in relation to the allocation of transport infrastructure funds". The evidence for this under-funding comes in two parts. The first part quotes Baroness Kramer on actual expenditure - London gets about twice as much public expenditure per head as the rest of the UK (part of which is due to cross-rail). This figure is probably misleading because it compares a specific city to a set of regions. If you took, say, expenditure in Manchester it would be interesting to see how much closer it got to the London per capita level. No matter, because the second part of the argument uses the incredibly misleading IPPR North figures which talk about disparities in future funding streams of £2,500 per head in London to £5 per head in the North East. No adjustment would make those look equal. Regardless of the exact amount, let's take at face value that there is some spatial unevenness in public expenditure in transport spending per head. The transport select committee implies that this is a bad thing and that the government should be seeking a more equal distribution. This begs the question, "why should funding be more equal"? The answer to that can come in two parts - either the current allocation is inefficient or it is inequitable. In terms of efficiency a big part of the disparity between total and public expenditure (which would be larger than the two to one figure that I reported above) comes about because private sector expenditure goes disproportionately to London and the South East. Government doesn't have much control over those private sector flows but it's clear that public sector expenditure is more evenly spread. Taking a narrow view of the economic returns on public sector transport investment this suggests that it might be efficient to have it more concentrated, not less. Of course, government doesn't take a narrow view. It thinks about the social returns as opposed to the private returns that drive private sector investment. Might the social returns be larger outside of London and the South East justifying a more equal distribution? Again, the answer is probably no from an economic cost-benefit point of view - the wider economic benefits that are captured in transport appraisal tend to occur in more dense, productive places. In contrast, on a project-by-project basis it's almost certainly the case that there are some London schemes that look poor value for money relative to non-London schemes and vice-versa. But I haven't seen any evidence that this is true on average (which is what we should focus on if we care about shares of expenditure). We could construct an efficiency argument for greater spending outside of London and the South East if we thought that this was vital for improving economic performance (or for turning economies around). But as Ed Glaeser has observed, places which have seen declining or low population growth usually have relatively high per-capita infrastructure stocks. [As evidence of this, note that journey times and congestion levels are significantly lower outside of London and the South East]. If this is the case, then further investments in transport will experience decreasing returns and won't do much to increase growth. To put it another way, if the problem comes from structural change, poor educational outcomes and skills that are no longer needed - why should increased transport investment provide a solution? Transport may be an issue in some of the more successful economies outside London and the South East - Manchester, Leeds, etc - but surely not everywhere? If the efficiency arguments are weak, the equity arguments aren't great either. Why do we care about the balance of infrastructure expenditure per se? Surely we care about the provision of transport services, broadly defined. Is it fair to invest in areas with low congestion at the expense of investment in areas with high congestion just to ensure that expenditure is equal? Why should we invest equally in places with no or slow population growth at the expense of places that are seeing high and continued growth in population? Why do we need as much investment per head in towns with a population of 100,000 as we do in cities with populations of millions? Worrying about the efficient and equitable use of transport expenditure is incredibly important. I'm certainly not arguing that we currently have it completely right. But simply asserting that we must have more equal expenditure does nothing to help us figure out whether and how we should be changing the current balance of funding. Is Help to Buy 'working'? 1. How many people are likely to be affected? 2. If the policy affects relatively large numbers of people, what's the likely impact on the housing market? If you want to solve the housing crisis you need the answer to (1) to be 'lots' and the answer to (2) to be 'does not increase house prices, but increases supply'. On (1): Currently Help-to-Buy has assisted 7,313 people. This is not a lot. On (2): If Help-to-Buy ends up helping a lot of people, it will increase demand, rather than supply. This will push up prices making housing less affordable. In other words, if Help-to-Buy does 'work' it won't 'help'. Is there a London Housing Bubble? The latest figures showing London house prices up 17% in a year can only fuel speculation about whether London is experiencing a housing bubble. Tim Harford and Simon Wren-Lewis have both provided thoughtful commentary on this in the last few weeks (as, I am sure, many others). I don't have anything much to add to the debate on whether there is a bubble. As Tim Harford makes clear, I'm not sure how we'd know. But, to some extent, it seems to me that all this debate about whether or not there is a bubble deflects attention from the more fundamental point: highly inelastic housing supply leads to both high prices and greater fluctuation in prices. Indeed, the last time my colleague Paul Cheshire looked at the figures, the volatility of the UK housing market as a whole exceeded the volatility of the most volative metropolitan market in the US (at the time, LA). The recent housing market problems in the US may have changed the relative volatility for a few metro areas short term - but with London growing at 17% it won't be long before we reclaim our 'crown'. Highly inelastic housing supply adds to volatility because any increase in demand gets translated in to rapidly rising prices. Whether that demand comes from income growth, lower mortgage rates, easier borrowing, foreign buyers or some other structural shift, the result is large increases in house prices. This, in turn, tends to feed back in to demand as people come to expect capital gains. When structural factors shift in the opposite direction, or expecations change falling demand now translates in to falling house prices. Result - high volatility. Even in Simon Wren-Lewis view of the world, where the underlying shift in demand reflects low expected yield on other assets (rather than a bubble), it's still the highly inelastic markets that will see the large capital inflows. At the very least, if supply was more elastic, this inflow of capital would lead to increased housing supply, lower longer run rents and more affordable housing. Is there a bubble? Who knows? But let's try not to have arguments around that question detract from the far more fundamental question of what we can do to try to increase housing supply in the parts of the country where demand is high. We all know there is a housing crisis. The latest data show that on the best measure of affordability (the price of a house mid-way in the price range relative to earnings mid-way in the range), the national position is half 1997 levels and not a lot better than at the worst point in 2007. The debate about causes is full of myths, many self-serving - such as the claim that weare in danger of concreting over England. As I showed in a recent article, the reality is that Greenbelts cover more than 1.5 times all our built- up areas put together. Surrey has more land for golf courses (2.65%) than for actual houses (2.06%). The most important reason for the crisis is that we have been drastically restricting the amount of housing land since 1947. Furthermore the recent changes embodied in the National Planning Policy Framework, far from increasing the take of ‘Greenfields', seem to have done the opposite. House completions have increased from the catastrophically low levels of 2009 but housing starts – what is in the pipeline – have fallen by nearly 10% and planning applications are flatlining. There are problems of market failure, and land markets fail more than most. So they need regulation, which is what planning should do. But effective regulation also needs to be informed by an understanding of how markets work. The problem is that our planning system seems to proceed as if it could entirely suspend the laws of supply and demand. It is not just that restricting the supply of something when demand is rising (in this case land when incomes and population have been rising) causes the price to go up. But if you persistently build Reliant Robins and people prefer VWs, then VWs become a luxury good and unaffordable. Roughly speaking, that is what we have been doing with housing supply. We have not just been restricting the supply of land to build them on but we have persistently been building the wrong sort of houses in the wrong sort of places. Houses do not move about. So demand is local - primarily where there are decent jobs. But also the evidence shows that as people get richer they try to buy more space (VWs rather than Reliant Robins) with a bit of garden and somewhere to put their VW. We may wish to persuade people to use cars less and revive the prosperity of declining parts of the country. But it is insanity to try to achieve those objectives by refusing to allow houses to be built where there are jobs, where they are most expensive and without reasonable space. When lobbyists for the Greenbelt claim there is an ample supply of brownfield sites, not only do they fail to recognise that brownfields are a legal concept including some of the highest quality amenity land in Britain but not much of it is where job prospects are good. This is true even within southern England. Corby in Northants has a brilliant record ofbuilding houses. Daventy in Northants does not. Corby has the most affordable houses in Northants while Daventry the least. The unemployment rate in Daventry is less than half that in Corby (link). A similar tale can be told of Lancashire comparing Preston and Ribble Valley; or Watford compared to Three Rivers in Hertfordshire; or Aylesbury Vale compared to Chiltern in Buckinghamshire. All over the country more houses are going up where they are already least unaffordable and where unemployment is high relative to surrounding areas. London illustrates this perfectly. Not only are we concentrating new building on the land most exposed to flooding and rising sea levels in the East Thames Corridor, but as the table below shows, we are building them where they are already least unaffordable and where job prospects are worst. And it is not just across broader areas that there is this focus on building houses in the wrong places. It is within cities too. In my new book with Max Nathan and Henry Overman, I give a striking example. In 2009, the West Midlands Regional Spatial Strategy was being discussed in a public hearing. When the local planners were asked why the plan was not allowing building in more suburban areas, at lower densities, the answer was that if sites like that were available developers would just ‘cherry pick them’. In plain English that means that developers would try to build the sort of houses people wanted to live in the places they wanted to live. So obviously we should not let them do that. All this means that we have far too many Reliant Robins and not nearly enough VWs in our housing stock. Except when it comes to housing, housing Reliant Robins are even less mobile than the real things. Not only are our houses inferior in terms of type and space, they are in the wrong places.